The presented component is created in a round base and set with a pipe and two parts at sides. Confidence of quality is guaranteed by the materials for a rigid construction to support the daily operation of your machines. With the advantage of precision CNC milling, accuracy is maximized for extremely tight tolerances in less than 0.005mm. • Made of quality materials sourced from Japan, Germany and China upon requirements. • Machine component in a round base. • In golden metallic finish. • With a pipe in the center and two parts at sides. • Guarantee to meet RoHS standard. • Available in assorted metal: stainless steel, carbon steel, free cutting steel, brass, aluminum and titanium. • Available in other materials like nickel silver, beryllium copper and hard plastic. • Precision metal milling: length 100mm, width 100mm, weight 0.5 mm, accuracy <0.005mm. • General metal milling: length 3000mm, width 1000mm, height 1000mm, accuracy <0.01mm. • Surface finish: hand polishing, vibratory polishing, sand blasting, electroplating, anodizing, powder coating, PTFE coating and etc. 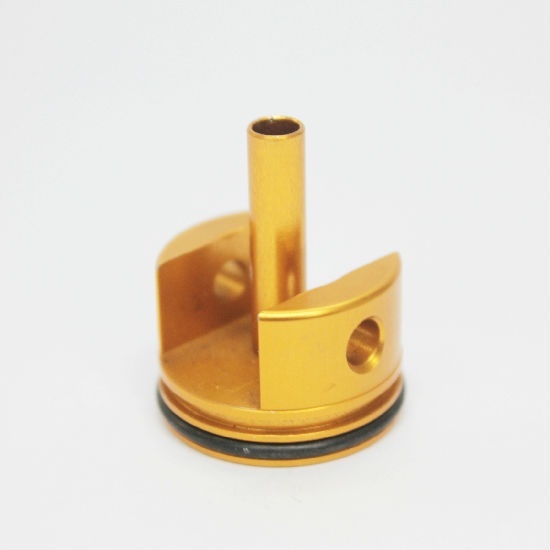 • All of our products are manufactured by 3-5 axis CNC machines. • Allow own designed module constructions. • Welcome OEM and customized orders.